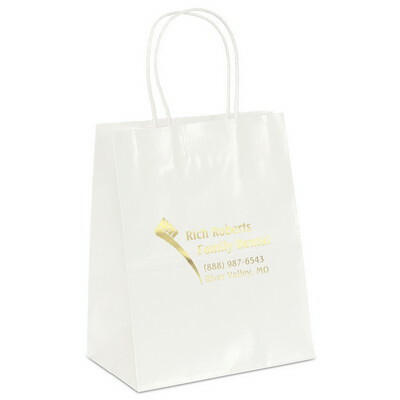 This custom logo Amanda gift bag - white features twisted Kraft paper handles. Help your customers to elegantly pack their gifts with the Amanda gift bag - white. Add your company’s logo on the bag through foil hot stamp imprint to effectively market your brand. This gloss paper shopper bag with serrated cut top is 100% recyclable. The twisted Kraft paper handles make it easy to carry the bag. It is available in classic white color. Give away this cost effective bag at weddings, trade shows, and other festivals, to easily promote your brand’s image and value.